Situated at the distance of 18 km from Panaji, the state capital of Goa, Anjuna is a small village on the seashores of the Arabian Sea. Popularly known as the freak capital of the world, Anjuna beach comes alive with its ever famous full moon parties and famous flea market. 10-km west of Mapusa, Baga Beach is basically an extension of Calangute beach. A rocky wooded headland marks Baga Beach. In fact it is very difficult to mark where one ends and another begins. Baga River runs one side the Baga Beach that gives pleasant diversion especially for children. Nestled on the southern side of the headland that divides the Zuari and Mandovi estuaries, Dona Paula beach is situated at 7 km from Panaji, the capital of Goa. This beach provides a panoramic view of the Mormugao harbor. The beach offers to the tourists to have a sunbath and buy cheap seaside goods from local vendors. known as “Queen of Beaches” Calanguate is a haven for hippies because it was the hippies who discovered this beach. It is Goa's busiest and most commercialized resort. Situated at the distance of 7 km, Benaulim Beach is less than 2 km south of Colva Beach. 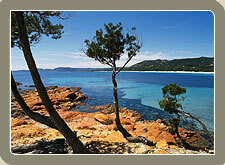 The beach has good accommodation facilities with fine restaurants bars. One of the most famous tourist destinations in Goa, Cavelossim Beach is considered as the most beautiful beach in south Goa. 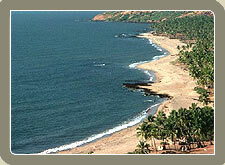 The gorgeous Cavelossim beach lies between the Arabian Sea and the Sal River. Your visit at Cavelossim beach can be memorable because it offers a complete holiday with attractive shopping opportunities. Located at the distance of about 10 km from Mapusa, North Goa, Chapora Beach is one of the most interesting beaches of Goa. The beach has many regular cafes and restaurants. The most famous attraction here is Chapora Fort and the houses built in dense groves of coconut palms. Less crowded and a quiet beach in comparison to Anjuna or Calangute, Condolim beach offers various water-sports activities-right from parasailing to water-skiing. Bogmolo Beach is an ideal clean and not too crowded, the water reasonably safe for swimming, and plenty of places to eat, drink and shop at. 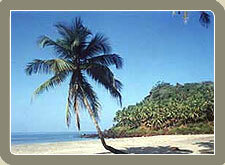 Just 3-km away from the capital city of Panjim, Miramar beach is popularly known as “Gasper Dias”. The beach is ideal place for evening walks. The beach provides the panoramic view of the Aguada Fort just across the Mandovi River. One of the most enchanting beaches in Goa and situated at the distance of 37 km from Margao, Pololem Beach (also known as Palolem Beach) is a beach of white sand facing a crescent shaped bay between two headlines. Located at the distance of 22 km from Panaji, the capital of Goa, Vagator Beach is a beautiful beach is a cool rural area and has no big shopping complexes. It has an excellent and hassle-free atmosphere. Located at the distance of about 2 km from south of Benaulim Beach in South Goa, it is one of the most impressive and lovely beaches of Goa. Verca Beach is a destination where one can find the very basic stuff of Goa. Besides the natural beauty, the fabulous beaches and sunshine, travellers to Goa love the laid-back, peaceful, warm and friendly nature of the Goan people. The hottest spot for beach holidays in India, Goa is known for its golden beaches and is the ideal place to relax after any tour of India. The sandy beaches, aquamarine water and gently swaying palm trees provide the most salubrious tonic for the body and the soul. Day 01 : Arrive Goa. 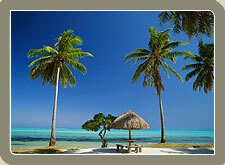 Known for its golden beaches is the ideal place to relax after any tour of India. It's Sandy beaches, Aquamarine water's and gently swaying palm trees provide the most salubrious tonic for the body and the soul. Overnight in Goa. Day 02 : In Goa. Full day free in Goa for leisure activities. Overnight in Goa. Day 03 : In Goa. Full day free in Goa for leisure activities. Overnight in Goa. Day 04 : Leave Goa for onward destination.